> Small farms: A secure future through rural-urban transition? Biotechnology is not solely concerned with the production of genetically modified crops. The United Nations Convention on Biological Diversity (CBD) defines it as “any technological application that uses biological systems, living organisms, or derivatives thereof, to make or modify products or processes for specific use”. Thus, according to this definition, biotechnologies can be classified into three groups: ancient (breeding), traditional (industrial fermentation processes, chemical processes used to create medicines and synthetic products) and modern. the production of organic fertilisers and the search for antagonist microorganisms. The identification of genetic resources primarily enables us to go beyond traditional morphological descriptions so as to arrive at more reliable results. The conservation of natural resources, which is usually based on species composition, could greatly benefit from more precise information on the genetic diversity within each species. For example, recent in situ work carried out in an Eastern Cameroon forest has revealed the wide genetic variability of sapelli, a tree species that is currently logged there. This type of information could also be applied to species selection, through the quantification of certain ecological and economic attributes. Here, the authors view biotechnology as a complementary instrument to, and not a substitute for traditional selection programmes. 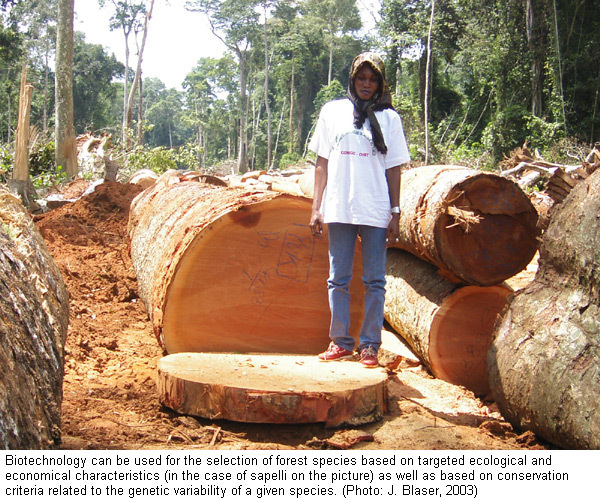 Forestry programmes could use the vegetative multiplication of forest species to increase the given genetic material and to stock it appropriately. Somewhat paradoxically, it could also help to ensure the availability of a substantial base of genetic material and the gradual introduction of new clones to maintain the genetic variability of the species concerned. In vitro selection and cellular tissue cultures benefit certain techniques already in use in Cameroon (hevea, cocoa, and coffee) and in the Democratic Republic of Congo (multipurpose trees, such as Acacia auriculiformis and Leucaena leucocephala). Cryoconservation and in-vitro conservation help to reduce the risk of diseases which threaten gene banks. Many specialists are interested in the genetic modification of trees, particularly fast-growing species which lend themselves to intensive production. However, a concomitant risk is possible cross-pollination with natural species, particularly those close to the centre of origin of the given species. Finally, biotechnologies could also be a benefit for the less common areas of forestry resource management, such as the search for antagonist microorganisms of harmful insects that can fertilise the soil and enhance species production. Despite these many advantages, most African countries suffer from severe shortages in terms of the material and specialist skills needed to apply these technologies. The use of modern biotechnologies especially in Africa, a continent with great biodiversity, should be debated openly and involve local specialists with relevant and sound information on the issue. Small farms: A secure future through rural-urban transition? Small farms certainly do have a future, also in sub-Saharan Africa - this opinion was upheld at a workshop on the future of small farms. The majority of the rural population in sub-Saharan Africa is engaged in agriculture. The size of farming operations in this region is decreasing, in many cases down to smallest-scale subsistence farming. As a result, efforts towards food security are severely hampered even by smallest changes in the environmental conditions. Models that promise growing income are hardly applicable in the rural areas of sub-Saharan Africa. The Asian “Green Revolution” cannot simply be copied due to different crops and cultivation methods. The author, who is rather sceptical about agriculture, believes that agricultural optimists underestimate the negative consequences of market liberalisation and the phenomenon of decreasing farm sizes. He agrees that strategies for reducing poverty in rural sub-Saharan Africa must continue to be based on yield increase, but in addition he emphasises that they should also build on accelerated rural-urban transition, i.e. on more trade and services. In his view, human mobility is the most important factor for economic growth: Poverty reduction efforts are most effective where growth, infrastructure, transport and communication are already established. Water is not always the same and there is more of this resource than development policy makers and hydro specialists have so far acknowledged in their supply concepts. How is this possible? The “blue water” we see in rivers and aquifers is not the only form of water. There is also “green water”, made up by the 65% of precipitation that first remain in the soil in the form of humidity, are then stored in plants during their growth, and are finally released back into the atmosphere through evaporation. Seventy percent of the world's rural poor live on rainfed agriculture. In these arid regions, improved management of “blue water” will not be sufficient to secure food and water supply. On the contrary: the approach will have to be extended, and the focus of all efforts shifted to centre on the significance and the management of “green water”. A new policy document by the Stockholm International Water Institute uses easily understandable water cycle diagrams and geographic overview maps to illustrate the importance of the “green” water cycle for humanity. Some research associations (International Fund for Agricultural Development IFAD and Global Water Systems Project GWSP) are already working on “green water” projects. Source: Rain: The Neglected Resource. M. Falkenmark, J. Rockström. 2005. Swedish Water House Policy Brief Nr. 2. Stockholm International Water Institute (SIWI). 16 p.
Despite the region's comparative advantages, such as low salaries, products from the sub-Saharan countries cannot compete on the globalised markets. The advantages are outweighed by low productivity, high marketing costs and the continued existence of trade barriers. At the same time, the demand in Africa, particularly for food products, is rapidly increasing. Already now, 25% of the continent's cereal supplies are bought on the international markets. Among other things, this means that Africa imports maize worth the total value of African coffee exports. A study by the International Food Policy Research Institute shows that many African countries import products from overseas that are produced at a low cost by their own regional neighbours. The authors suggest that African countries should begin to develop their regional markets. This would mean removing trade barriers within Africa. Model simulations show that this measure could enable the continent to increase its total agricultural exports by as much as 19 percent. Coordinated investments in regional agricultural productivity, infrastructure, research and the strengthening of regional institutions, could further increase the region's economic growth and competitiveness. Even in disadvantaged societies, minorities usually account for a disproportionately high portion of the poorest and most severely marginalised population groups. Since the current specific targets for achieving the Millennium Development Goals (MDGs) do not explicitly require integration of minorities, most programme formulations to date do not include any special mention of minority rights. This gives rise to the fear that the poorest of the poor will continue to be further disadvantaged. Five years after the UN Millennium Summit, the Commission on Human Rights has examined the 8 MDGs and attached articles with a special focus on minority protection and human rights. The working paper suggests three entry points for improved integration of minority rights in national MDG processes: implementation planning, country reports, and advocacy. The paper provides a broad and well-founded range of arguments for the specific inclusion of the three key pillars of minority rights – non-discrimination, protection of identity, and participation. It offers both food for thought and concrete suggestions on how to integrate minority rights. Marginalised communities have few means to draw attention to the disparities between the rights which national legislation affords them and the day-to-day application of such laws. “Good, average and bad (GAB)” is an instrument to evaluate and, where necessary, to improve the impact of existing legislation on communities. The key steps in this process are identification of legal provisions, investigation of existing implementation mechanisms, and the identification of evaluation criteria. For this reason, it is essential that good, average and bad cases are subjected to comparative analyses. A study aimed at improving negotiations between forestry concessionaires and local communities in Mozambique has thus identified six ways to adapt the legislation to secure the intended rights and benefits of the poor who earn their livelihood from the forest. The main strength of this instrument is that it allows for all issues relating to the actual application of the law to be scrutinised. However, it is highly complicated and requires the involvement of third parties familiar with both the methodology involved and with the specificities of the community in which it is applied. Development projects are continually confronted with new questions and problems. Advanced training can help enable project staff to react successfully. But which courses are offered where? When are they offered, and how much do they cost? The new, thematically enhanced version of the InfoAgrar Training Directory offers useful guidance. It has a global focus with a particular emphasis on courses in developing countries. In addition to normal courses, it also contains a list of distance learning offers. The directory is freely accessible on the Internet and lists around 350 courses on rural development, covering both technical and methodological/conceptual topics, such as project management, health issues, market access, biodiversity conservation, livestock production, and many more. The offers can be searched by topic, by country, by institution, or using free keywords. For each course, a detailed view provides information on qualification requirements, content, duration and costs, along with a contact address. Why should donors in development projects not approach their partners in the role of buyers of a product? Starting from this provoking question, the Swiss NGO Helvetas has in several projects begun to implement the principle of “Results Based Payments”: A purchaser (i.e. the donor) mandates a contractor with a certain task, for which the two parties jointly determine the results to be achieved. The contractor is paid according to the results that are actually achieved. 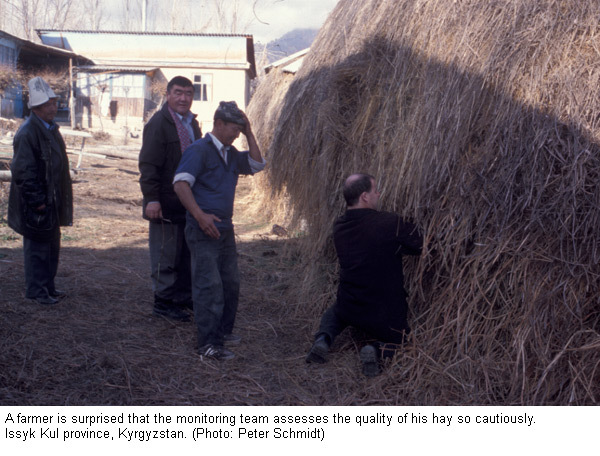 This system has been introduced, for example, in a project for the improvement of agricultural extension in Kyrgyzstan. The regional consulting institutions are no longer paid for their expenses, but according to the number of demonstrations carried out, the number of farmers who were able to increase their income, or the degree to which innovations were adopted. So far, experiences have been largely positive. Compared to the previous system of expense-oriented budgets, the efficiency and the effectiveness of projects have clearly increased. However, the new system can only work if the mandate and the results to be achieved are negotiated in a transparent manner and if their effects are of a sustainable nature. Another crucial element is a thorough and effective monitoring of results. With small adaptations, the concept can be transferred to a broad range of contexts. Source: You pay for what you get. From Budget Financing to Result Based Payments. Markus Arbenz. Experience and Learning in International Co-operation, Helvetas Publications, No. 4. Helvetas, Zürich, August 2005. Development projects and programmes work with ever more local partners who are often widely dispersed geographically. Hence, the clear need for a strategy which would enable participants to learn from the experiences of the other project/programme areas, and to structure them in such a way that these could prove beneficial for future work. In Bangladesh, the Livelihoods, Empowerment and Agroforestry project (IC-LEAF) considers experience capitalisation as a process of continual learning and change, which is driven by different project members based on their own experiences. LEAF defines the product of experience capitalisation as capital to be re-invested. This project is innovative in terms of its interest in and handling of “how” and “why” an objective was achieved, rather than “which” objective was achieved. It is this feature which differentiates experience capitalisation from success stories. 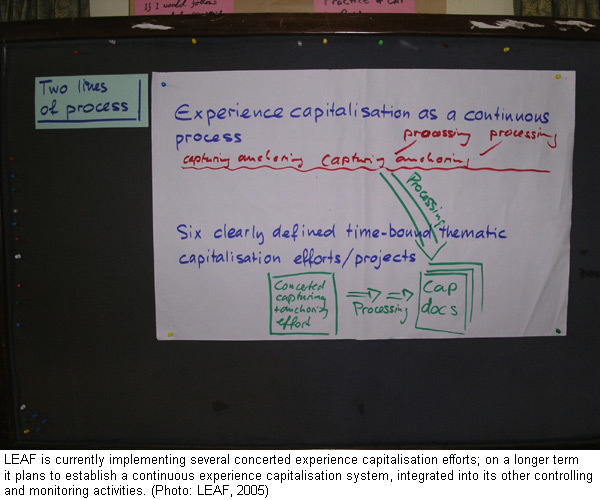 The article explains how experience capitalisation is implemented, setting out each stage and the structure of the process. For leaders of development projects, it will serve as a helpful knowledge management guide. In Latin America, some small producers in the agricultural sector (crops/livestock rearing) join forces to create companies that are better able to compete with their larger rivals. This is made possible by assistance provided by the state and by international cooperation. A case study analysed 35 rural associative companies in seven Latin American countries. The same methodology and selection criteria were applied across the board. Conclusions were first drawn at country level and then at the regional level. 10 success factors could be deduced from the experiences of companies in the Andean region. These included proximity to the given market, the company being run according to democratic principles, the ability to develop alliances with assorted market agents, and a favourable entrepreneurial climate. In addition, the study aimed to examine the issue of balancing the social accumulation of the company, the benefits accrued by the individual partners and adequate conditions for producers. These conclusions should assist with the future direction the region will take, and help to ensure the involvement of all stakeholders: producers, company owners, private development bodies (NGOs and projects) as well as representatives from the public sector associated with this issue. This article describes a new approach to participatory project impact monitoring called the Most Significant Change (MSC) technique. Using open questions as entry points, stories are collected from the involved population that describe as adequately as possible the changes that the project activities have brought about in the local context and how these changes are perceived by the people. In a participatory process, the most significant among the total of collected stories are selected and then systematically analysed. Analysis focuses on intermediate outcomes and impacts. The guide is divided into two sections. The first five chapters introduce the method and can be used as a manual, while the second five chapters provide the theoretical background and additional information. Unfortunately, the text only gradually reveals that MSC is not a complete monitoring and evaluation method, but rather a tool to complete existing approaches. The analysis procedure is only lightly standardised and leaves ample space for discussion and interpretation by users. It is therefore also particularly well-suited for stakeholder discussions and processes of learning and consensus-building within user groups.